Early in 2017, I received a bulk email from a company called PCA or Positive Coaching Alliance. I quickly read through it and put it to one side until I had more time to pursue it. About a week later I clicked on the email and watched a movie about coaching young players from Phil Jackson, the great basketball coach, and I was immediately sold. Even though at that time I thought it was going to be an expensive package for our club for training, I still sent out links to a couple of their videos to our coaching staff. 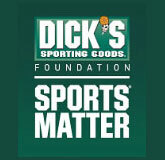 There was a great cross-section of famous coaches from different sports donating their time to help this organization. Later that week I got talking to Paulo Espinoza, who is one of our newer competitive coaches. Paulo was hired because of his quiet demeanor and his positive approach to coaching younger players. I had watched him on numerous occasions while he was taking his National D License and was impressed at the way his players were enjoying their game. Parents especially liked the way their children were coached and treated by Paulo. I found out that Paulo was a staunch believer and subscriber to the Positive Coaching Alliance and had taken all of their on-line courses. It made sense, and Paulo was living proof of how a different approach to what we are used experiencing can change the attitude of so many. PCA teaches that children should look forward to their practice sessions and games – it should be a safe and happy environment for all players. Every athlete that shows an interest in a particular sport should have the option to play regardless of their ability. Recreation is the starter area and Competitive is for the more skilled. Players love to impress their parents and family members who should also take an active part in their experience. This builds confidence and pride in the player. Coaches understand that they are teaching ‘Life Lessons’ and they agree to respect the game, the officials, the players and the fans. Of course coaches want to win as does everyone, but this is not their main purpose. They should always build the player up, improving self-esteem and teaching good moral standards. Parents and fans should uphold the same approach and sense of responsibility as the coaches. Players have a voice too! It is up to the coaches and parents to listen to them and learn as we all do from each other. This builds motivated leaders for their future. We should never force players to play only one sport so early on in their lives. 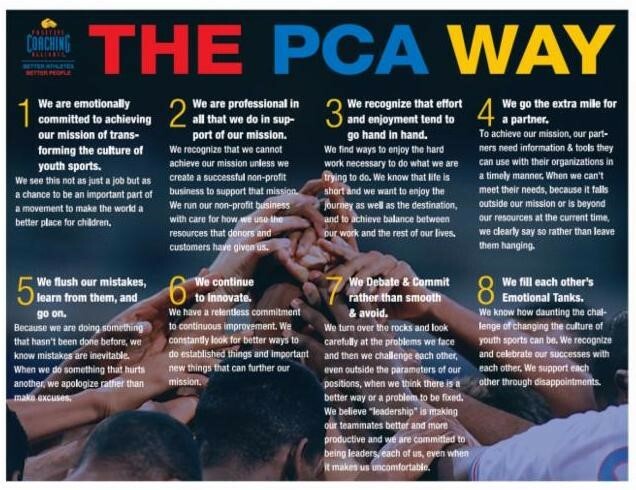 Paulo has agreed, in the not too distant future, to introduce the PCA way of coaching to our Recreational coaches. 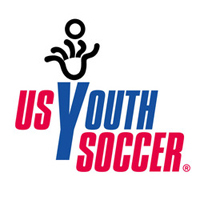 We can then monitor the results at the very grass roots level of our club soccer. This will be a massive step in the right direction and will hopefully create this happy, enjoyable environment for all of our players. Competitive coaches too will be seeing some distinct changes in the future, and in 2018 we will be implementing many of these. This will not take away or disrupt our professional coaches individual approach, it is just a common sense addition to their methods. During the first few weeks of our Recreational and Competitive seasons, we have been experiencing many injuries, most of them minor, but a few were quite serious. Concussion has become one of our main concerns this season, as it should be. As you know, if you are a parent of a competitive player or a coach, you have taken the on-line concussion course and passed the required test, which demonstrates that you understand the details. We are all still learning about the damage a concussion can do to a young player in any sport, and so we all must be conscious of what needs to happen in the event of a potentially concussed player. Referees in particular are extra vigilant this year and will list any head injuries on their game reports. If that player is listed as having a potential concussion, then it is up to the parent to make sure that they see a physician as soon as possible. FC Heat and Escondido Soccer Club will not allow that player to practice or play until a medical clearance has been received from their physician. Coaches are aware that they too will not be able to have that player on the field without the required medical clearance. It is always a good practice for the coach or manager to approach the referee after the game to see if he or she logged any injuries on the game report. Our Annual General Meeting is scheduled for December 6, 2017. This is where we prepare the club for the coming year and set our budgets and vote in our volunteers, etc. If you are interested in volunteering your time to help Escondido Soccer Club and/or FC Heat Elite please attend. We will be giving out details about the venue as we move closer to the date. DO YOU KNOW ANYONE INTERESTED IN SPONSORING OUR CLUB? 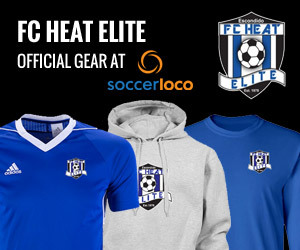 As you all know, Escondido Soccer Club including FC Heat Elite is a non-profit organization. We are always looking to raise money for new programs for our players and their families. Sponsorship, especially corporate sponsorship is always needed. The amount of money we as a club spend in just keeping the wheels turning sometimes boggles the mind. Our goal is always to break even, but in today’s economy this sometimes becomes difficult to achieve. If you or your company would be interested in sponsoring our club, please talk to Michaela Krams our Director of Marketing. Many of you commented on the ‘Juicing’ segment’ on last month’s newsletter asking me for the source. The article was taken from a blog by Reagan Yorke, which you can access by clicking here: ReaganXO.com. As you know, I promised to keep you all updated on my family’s efforts to get both of our teenagers into the college of their choice, without breaking the bank. We are still working with Ducerus and my kids have monthly appointments with Sylvia our consultant/counselor. In between these visits, they are consistently working on the Ducerus software program, which helps them to improve their SAT and ACT scores. This is definitely working as both of their scores are improving and are now within the parameters for the colleges that they are actively looking at. They are consistently writing essays for applications and having these read and edited by someone other than myself. In my opinion these are improving immensely. Their school grades are getting better as they are conscious of what needs to be done for their own futures. Lennon my son was initially looking at California schools, but now is being swayed towards a private university in Boston. The costs are astronomical at Boston University, but when Sylvia explained what we could potentially qualify for there was a significant difference, and also taking into consideration the potential less time spent there gaining his degree made Boston University a strong contender. Reagan wants to be centered in LA, so she is looking at the US and UC schools in that area. She has a 17 – 34% chance of being accepted in her first choices, so she is trying to set herself apart from other applicants by working on extra-curricular projects. If they both get accepted into the colleges of their choice they will most probably be taking out loans, as well as looking for jobs in the area in which they will reside. This unfortunately is reality. It is also becoming more apparent to me that many of our lower, working class families still have a great chance (with so many wonderful incentives available) to get their children into college. You would be very surprised at what funds are available to families with lower income, However, this income has to be proved in order to gain any financial aid, so your tax returns would need to be seen. A good time to start preparing for college is when your child is at least a Junior in high school. To be honest, we left it a little late. Concentrating on academics is still the key and sport is secondary. I will say this though; your child’s senior year in high school is highly stressful for them, so it is up to us to be very supportive.